Note taking tool Evernote has taken a page out of Omnifocus’s book, adding location tagging and filtering to it’s iPhone / iPod Touch application. 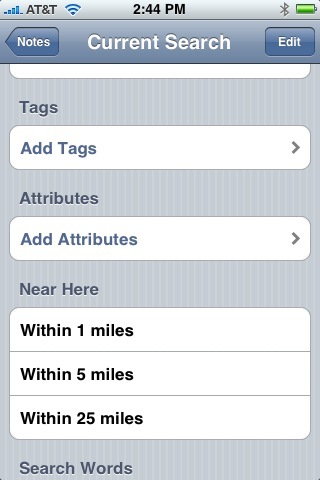 Now, notes you create with the Evernote mobile app are tagged with your location using CoreLocation. Location (with distance radius) has been added as a filter field for setting up new searches, letting you filter your notes based on this data. For instance, I setup a saved search called “Here” that only returns notes that were created within 1 mile of my current location. 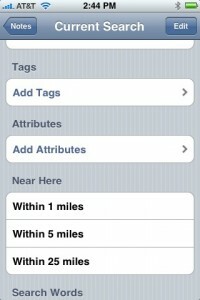 This could be used for a location context system, much like the one Omnifocus promotes. Personally, I still haven’t found a place for Evernote in my every day life, but I’m still excited to see the service grow and mature… it is shaping up to be an impressive product for sure.